Specializing in Trout, Salmon and Fly-Fishing Art. What's better than being able to do what you love. Trout fishing and art have been part of my life for as long as I can remember. Thank you for visiting my website; I hope you enjoy looking through the many gift ideas that I offer the angler. "Painting Trout and the World They Live In" since 1983.
" Painting Trout and the World They Live In"
Print this coupon and bring it to any 2019 show. Bring this coupon to any of the 2019 fly fishing shows that we are attending and drop by our booth to receive a free set of trout prints. At D.P. KRUPA Angling Art, we take pride in offering unique, one-of-a-kind items to the angling public. 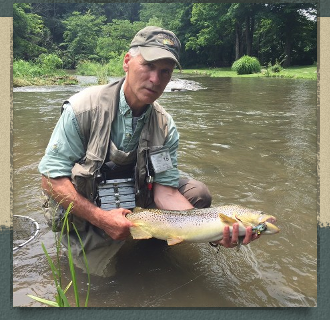 Whether you're looking for a limited edition print of your favorite trout stream, or a one-of-a-kind set of stoneware that was hand-crafted and hand-painted by the artist in the mountains of Western Pennsylvania, you can find it here. For more than 35 years, D.P. KRUPA has been painting trout and the streams that have inspired him throughout his life. We offer Trout Reproductions and Carvings, Limited Edition Prints. Original Angling Art, Hand Thrown Stoneware Mugs and other Stoneware pieces, Hand-painted Wine and Shot Glasses, Custom made Fly boxes, and custom printed T-Shirts and Guide Shirts with my original angling art. June 29th, 2019, Carlisle Expo Center - PA Fly Fishing Association Fly Fishing and Film Festival. "Painting Trout and the World They live in" for over 35 years.